Mods: Monster Mats, dark tails, flapper mod., 3M custom ClearBra, passenger seat storage drawer, Gorilla Gear. 35% window tint, clear side markers, ZiZa LEDs, beauty bezels for the dashboard knobs. Wheel centercap mods, R36 dead pedal, JCaps, blue coil covers, hole free grille, 4Motion plate frame & custom door sills, R32 seat handle inserts, trunk storage tray, EVOMS CAI, UniBrace UB & XB, Nitto Invos with VMR, v710s in hyper silver for summer - Nokian WRG2 on stock rims for winter, HPA Hockey Puck, P3Cars Digital Gauge, Tyrolsport brake stiffening kit, Goodridge SS brake lines, UM DSG/ECM software, HPA Haldex race controller. 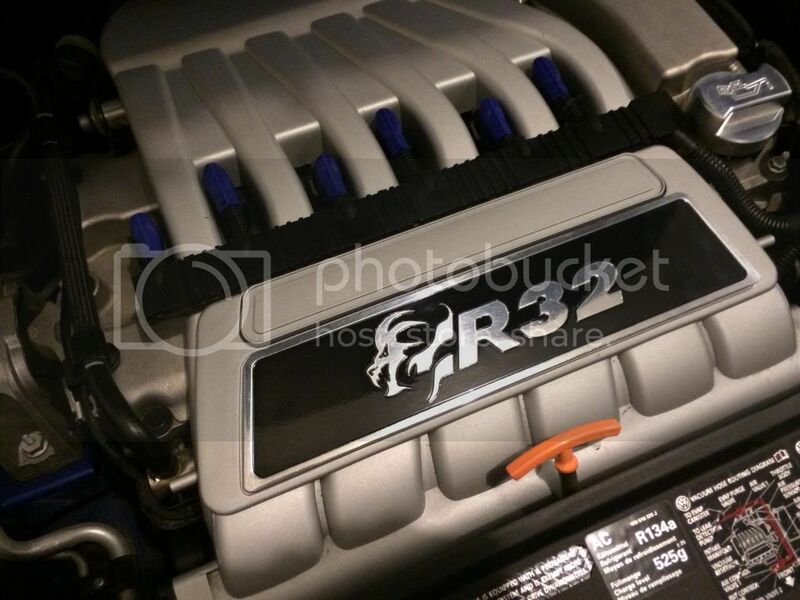 Custom R32 Engine Badge. Having a blast with the car and decided I would hang on to the car for a few more years. Also decided to amp things up a bit. In early 2014, I donated my car to e9performance as a development car for their new supercharger kit. Long story short, they have had the car in their garage, on and off for 3 years. As of today, I expect it will be back sometime next month. We have added a huge list of mods to the power plant to include Rotrex supercharger and forged internals. Car makes 372whp now and should eventually make 400whp with exhaust mods. Here is the link that details my build. No new mods this year. Just enjoying the car! Went to Wookies In The Woods this year and had a great time as usual. After the wookie weekend, continued for another week of vacation. Drove to Asheville NC, Charlston SC, then up to Norfolk VA and then home. Car was comfortable to drive for a long 2400 mile trip. This fall I went to DubDash 10 again. Had a great time. The Dash itself is always my favorite part. We didn't get the best time, but my navigator was my son Mike who was home for the week so we had a good time ribbing each other about his navigation and my driving skills. We only took one wrong turn this year and about 15 cars followed us. Blind leading the blind... I got to try out the new Haldex controller on some twisty curves. The car is rock solid through turns. Makes me a bit afraid of finding where the limits are. I drive in my comfort zone and have not broken the wheels loose yet. Also went to the 2012 Tipp City Cruise-In. There were about 800 cars this year. A few VW's this year. I was the only R32, there was a MK2 Scirocco and three beetles. The rest were cars of all shapes and sizes - vintage to Hot Rod. Had a great time talking to people about the R32 and telling them why the car is unique. Completed 40,000 mile service and added the HPA Haldex race controller. I'm expecting big things out of this new mod when it rains or snows or in the twists. UM DSG software added a couple of weeks ago while at Wookies in the Woods. Another great trip to The Dragon, with a bunch of great people. We had over 100 R32s this year. Fun times! Added Tyrolsport brake stiffening kit and Goodridge SS brake lines. Also p3cars digital vent gauge. Something new to play with. Got my HPA Hockey Puck installed today -- you can really feel the difference! Remarkable. Slight increase in vibration at idle, otherwise no detrimental effects. All good. Install by the local tuner took 45 minutes and $59 took care of that. As reported elsewhere, the most difficult part was to get the old mount out of there. Got in on a group buy and ordered an HPA Hockey Puck engine mount. It has been delivered, but I am still away. Will install it when I get home. Went to the Mum Festival as well as 3 other local car shows last October. Also went to Dub Dash Nein (9) held in Dayton. I WON the rally portion, with the best time. Got a cool trophy. Also got a new tag for my car. In honor of our annual R32 group trip to TOD, "Wookies in the Woods", I changed from "BLAU R32" to "CHWBAKA"
I'm spending summer 2011 (winter in AU) in Australia. My R is lonely at home. I am constantly reminded of my car as I see R32s daily here. - Last October, I participated in the Tipp City Mum Festival Cruise In, held in my town. It's a car show open to any kind of vehicle. Other than a VW Rail dunebuggy, I was the only VW there. 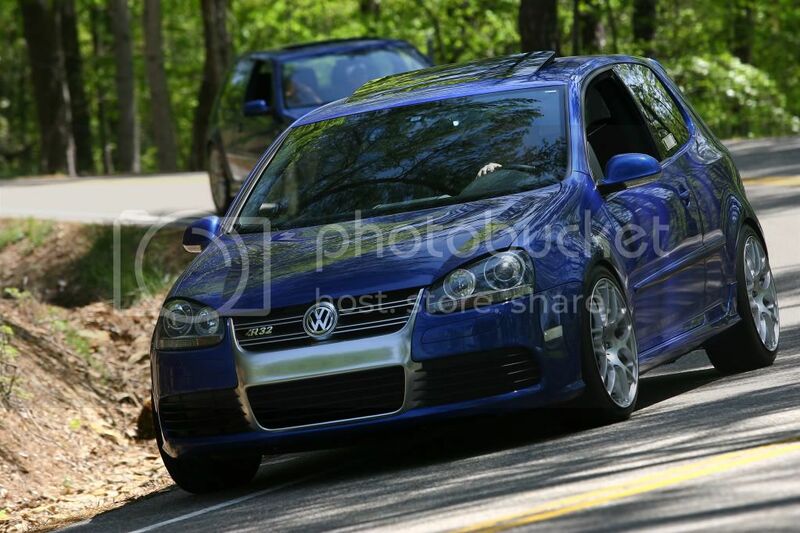 I consider it my VW outrach effort. Most folks were amazed that so much engine could be crammed into such a little space. Also participated in Dub Dash Ocho (8) held in Dayton. It's a 100 mile rally and fun car show. Had a blast and made a new Mk4 R32 friend form KY.
- Had the Mechatronics unit replaced in early 2010. My dealer service manager finally took my car for a ride and agreed that the lurching was not right. The car runs smooth as silk ever since. - Went to TOD in the spring and had a great time again. I think there were close to 130 R32s there this year. - Installed a new EVOMS CAI this summer. Love the sound. - Have ordered both UNIBrace's but have been on the road working and have not had a chance to install them yet. I will be working on this in October. Some people have replaced their tires 2 or 3 times. I still have 50% of the life left on my original tires. I must not drive as aggressively as some.